On Monday, January 28, Turner Classic Movies treats viewers to many hours of swashbuckling with an evening devoted to “Sword Play.” Two of the genre’s great stars, Tyrone Power and Errol Flynn, will be in the spotlight, along with Oscar winner Jose Ferrer and a pair of 20th Century Fox’s lesser leading men, John Payne and Cornel Wilde. 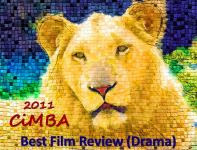 The first film in the line-up (8pm Eastern/5pm Pacific) is the best of the night’s offerings. 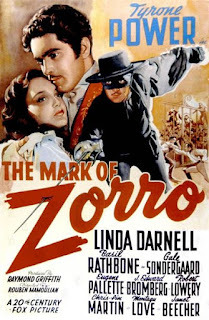 It is 20th Century Fox’s rollicking remake of a 1920 Douglas Fairbanks classic, The Mark of Zorro (1940) starring Tyrone Power in the title role, with Linda Darnell, Basil Rathbone, Gale Sondergaard and Eugene Pallette. Directed by Rouben Mamoulian, who would re-team with Power again for 1941’s Blood and Sand, the film was a blockbuster in its time that set the standard for the multitude of big and small screen remakes and sequels to come. Power’s performance as the fey-by-day/heroic-by-night Don Diego/Zorro is one of his signature roles - and The Mark of Zorro contains one of the all-time great swordfights on film. New York Times critic Bosley Crowther cited the “jim-dandy duel between Mr. Power and the villainous Basil Rathbone, which ends about as juicily as anyone could wish.” Rathbone, a skilled fencer, would recall, “Power was the most agile man with a sword I’ve ever faced before a camera. Tyrone could have fenced Errol Flynn into a cocked hat.” Rathbone, who dueled with both men onscreen, would surely have known. Alfred Newman’s memorable score was nominated for an Oscar and, more recently - in 2009, The Mark of Zorro was selected by the National Film Preservation Board to be added to the National Film Registry’s list of “culturally, historically or aesthetically significant” films. 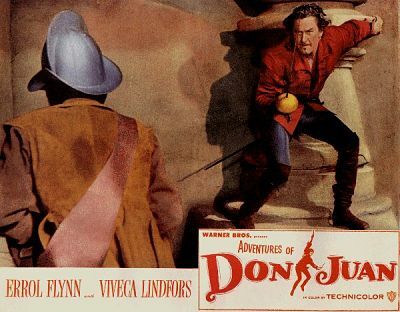 Next up on TCM’s Monday night schedule (10pm Eastern/7pm Pacific) is Adventures of Don Juan from Warner Bros. in 1948 starring the credibly cast Errol Flynn in one of his later swashbuckling efforts. John Barrymore had starred with Mary Astor in a silent 1927 rendering of the infamous lover’s legend. In the Warner’s production, directed by Vincent Sherman, the great ‘swordsman’ is compelled to provide assistance to his queen (Viveca Lindfors) and country. With this film Flynn was returning to a familiar genre following the so-so reception of his most recent post-war films. 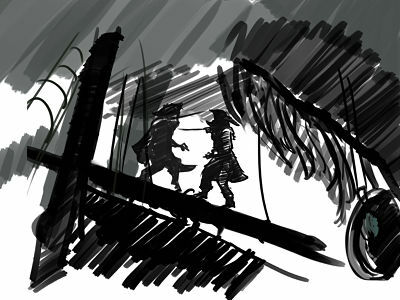 Though Adventures of Don Juan was not a great box office success, it won an Oscar for costume design and a nomination for art and set design. 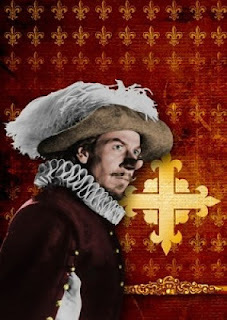 Cyrano de Bergerac (1950) from Stanley Kramer Productions, is set to air at midnight Eastern/9pm Pacific. Jose Ferrer won a Best Actor Oscar for his colorful portrayal of the poetic swordsman with the preposterous proboscis. Mala Powers co-stars as the beloved Roxane. Later (2am Eastern/11am Pacific), John Payne rides the waves in Raiders of the Seven Seas (1953) and finally (3:45am Eastern/12:45am Pacific), Cornel Wilde stars in At Sword’s Point (1951) as the offspring of one of the Three Musketeers. Maureen O’Hara co-stars. The Mark of Zorro is a favorite of mine and I barely remember Adventures of Don Juan so, because I'm going to be out Monday night, I'll be recording both. Monday marks my first sojourn this year to San Francisco’s Noir City festival. 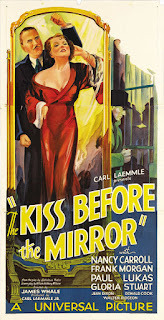 The night's program is a “Pre-Code Proto-Noir Triple Bill” – William Wyler’s A House Divided (1931) starring Walter Huston, The Kiss Before the Mirror (1933) directed by James Whale starring Nancy Carroll, Frank Morgan and Gloria Stuart, and Laughter in Hell (1933), a film thought to be lost but recently rediscovered, starring Pat O’Brien. I’ll be back to the noir fest on Wednesday night for “San Francisco Noir,” a double-bill we couldn’t resist featuring Edward Dmytryk’s The Sniper (1952) and Experiment in Terror (1962), directed by Blake Edwards and starring Glenn Ford and Lee Remick. Nice look at TCM's Monday night lineup. Hope you have fun at Noir Fest. Hi Kim - Too busy to blog lately, but I'm going to try to put something together on my forays into Noir City XI. I love swashbuckler films.. Count me in..
Rick, I can't say I'm a huge fan of swashbucklers - I tend to stick to Ty (My favorite of his is "The Black Swan") and Flynn. I'm very curious to revisit Flynn's "Don Juan." I know he was getting a bit long in the tooth at the time, but he rarely fails to charm. It's also been a very long time since I've seen "Cyrano," so I'm recording it, too. Not a big fan of the swashbuckler films though I do like CAPTAIN BLOOD and THE BLACK SWAN. EXPERIMENT IN TERROR has a terrific and scary performance by Ross MARTIN and from the male point of view Lee Remick radiates sophisticated beauty. Tensely directed by Blake Edwards. I saw THE SNIPER a few years back and it definitely deserves to be better know. A tough little film. Enjoy the fest! John, We're on the same page re: swashbucklers. I first saw "Experiment in Terror" when it was in release - Ross Martin absolutely chilled me - he was terrifying (and brilliant). I lived in Southern California then and wasn't as familiar with SF locations as I've become since - am looking forward to finding out how the city fares through Blake Edwards' lens. Paul, Loved "The Sniper" - thought I'd seen it before but hadn't. Brutal. Shown at the festival after the movie screened was a short film that included clips of all the prominent SF locations as seen in "The Sniper" along with clips of the actual locations (street names were changed and one location was actually in L.A.) as they appear today. Much fun. Also am a fan of "The Lineup" and "The Big Heat" and just recently saw "5 Against the House" for the first time. Haven't seen "Murder by Contract" yet but will look out for it. Thanks! I adore swashbucklers! Erroll Flynn especially....sigh! THE ADVENTURES OF DON JUAN shows an already beginning to dissipate Flynn, but still I always enjoy it anyway. And who couldn't like THE MARK OF ZORRO? I mean, Tyrone Power in a cape and flashing sword. Double sigh. Coincidentally I wrote about another swashbuckling film on my blog this week: THE SON OF MONTE CRISTO with Louis Hayward. A very fun film. Speaking of swash and buckle, Eve - have you ever read the books of Rafael Sabatini? CAPTAIN BLOOD, THE SEA HAWK and SCARAMOUCHE - you can download Scaramouche for free from Project Gutenberg if you're interested. I LOVE Sabatini. Yvette, I hadn't seen "The Mark of Zorro" in quite some time and really enjoyed it again - and, yes, Tyrone Power was dashing enough to induce a double sigh. "Don Juan" dragged a bit, but Flynn was still (as always) enjoyable to watch. I haven't read any of Rafael Sabatini's novels, though I'm aware he penned many that become iconic films of the genre, including my other favorite Ty Power swashbuckler, "The Black Swan." I'll soon be over to read your thoughts on "The Son of Monte Cristo." Eve, the first movie I ever remember seeing as a child was "The Crimson Pirate", with an extremely athletic, grinning Burt Lancaster providing the sword play. I then spent much of my spare time pretending to be a pirate. Later I grew to appreciate Errol Flynn once I saw "The Adventures of Robin Hood" - great film, great score, iconic role. When I saw "The Mark of Zorro", though, it quickly became my favorite swashbuckler. Besides not being able to get it's musical theme out of my head, which still strangely emerges at unexpected times, I suppose I found Tyrone Power's "dual" perfomance (along with his "duel" performance) extremely compelling. There was something so frustrating, yet delicious, about Don Diego making everyone around him think he was a pompous dandy when he was actually the heroic and virile Zorro. To a small boy this was potent stuff. Actually, it's still wonderful. MCB, I'd forgotten the "Zorro" theme 'til I watched the movie again the other night and it came back to me with full force. The theme was also used for the much later TV show. If you watched the series, the theme probably became even more embedded in your brain. It was interesting to watch the Don Diego character - introduced as bold, confident, athletic - adjust his persona as he encountered those who would become his adversaries so he wouldn't threaten them. Well done and fun to watch. And then, of course, his transition to Zorro. I have read that David O. Selznick gobbled up almost all available color film when he made GWTW - which may be why "The Mark of Zorro" is in black & white, not color. It works well b&w, but I think color would've been even better. If you were to ask Becky the definition of 'swashbuckle' she would immediately say "Errol Flynn, of course!" However, whenever I read, hear the word 'swashbuckler' "The Prisoner of Zenda" always comes to mind first for some reason. Probably because I love that film. I see it every year and I love it even more than the very first time. Page, Errol was a consummate swashbuckler, but Ty as Zorro and Jamie-boy holds a special placed in my heart. "The Prisoner of Zenda" is a favorite and Ronald Colman (speaking of favorites) could 'swashbuckle' with the best of them. Swashbucklers are one of my favorite genre. They are so hard to do well, there's a reason why so few of them are considered classics. (I'm a big fan of all the films mentioned here). I recorded "At Sword's Point" that evening and really enjoyed it. It's a model of how to do a swashbuckler with "B" movie-like efficiency. I'm very envious of those noir films. 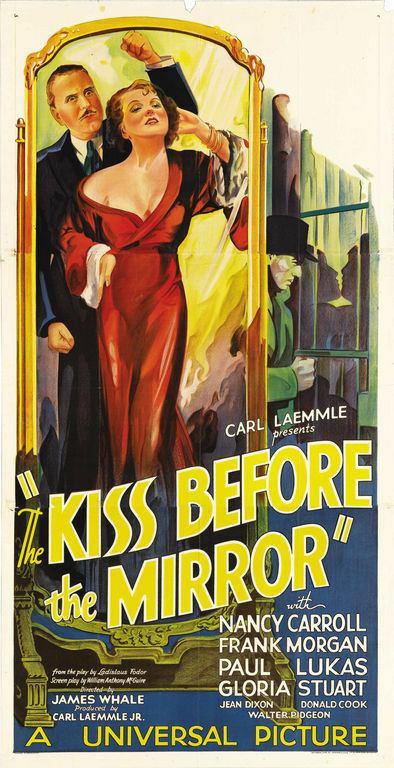 Always wanted to see "Kiss Before the Mirror." Hope you enjoy all of them. 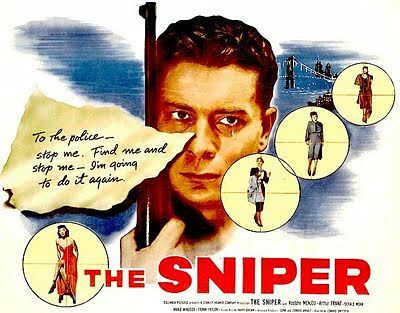 Kevin, My noir festival plans didn't turn out exactly as planned, but I did enjoy "The Sniper" which I saw for the first time. Very interesting short film screened just after it that included clips of San Francisco locations in the film with clips of the actual locations today. Next year I may just get a festival pass and see as many on the program as I possibly can.